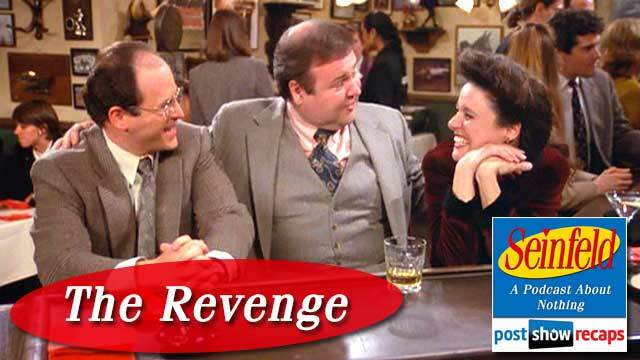 Akiva Wienerkur joined Rob once again, this time from his vacation spot nearby Del Boca Vista in Florida to discuss the next episode in the Seinfeld series titled “The Revenge”. Both were quite excited to cover a far more entertaining episode this time around after last week’s subpar “The Statue”. Akiva was delighted that they didn’t spend so much time and effort on the guest characters like they did with Rava and Ray last episode. They opened the show discussing how this episode reminded them how they are headed into a stretch of what greatness is to come. The show is starting to focus on the “core four”, with the storylines getting more complex and intertwined. Rob felt this episode, even more so than “The Statue” was where Michael Richards honed the Kramer character. He also pointed out that this is the first time we see the characters split off into two groups, two plots. In addition, there was a “B” plot with Newman telling Kramer he is going to jump off the building. Newman did not appear on the episode, and his voice was that of co-creator Larry David. Rob noted that the syndicated version actually dubbed in Wayne Knight’s voice in place of Larry’s. The episode plot is based off the real life story of Larry David having famously quit in front of many of the Saturday Night Live staff members, only to show back up the next Monday like nothing happened. The only difference from the episode being that Larry was actually allowed to stay with the job. The standup in the opening credits has Jerry talking about how criminals being arrested are always shown on TV covering their faces. It ties into the episode plot when Jerry talks about how the criminal must be trying to hide so his boss doesn’t find out it’s him. The opening scene begins with George bursting in to his boss’s office to tell him off and quit because he was no longer allowed to use his private bathroom. Akiva highly recommended anyone in a high rise office building to use the bathroom on the floor below if it’s going to take some time. The next scene is in Jerry’s apartment, and Kramer is telling Jerry about how Newman is depressed. Jerry is bagging up his laundry to bring to the “fluff and fold” Laundromat. Kramer asks him if he can throw in some of his clothes, though Jerry doesn’t want Kramer’s “boys” mixing with his. Neither Rob nor Akiva find this to be a huge deal, though Rob wouldn’t necessarily want to mingle his laundry with others. Jerry asks the guy at the Laundromat to wash Kramer’s clothes separately, and will pay whatever it costs. In the aftermath of quitting, George is at Jerry’s apartment discussing the jobs he’d potentially be good at. Both Akiva and Rob found this scene very well done. George is going over what he enjoys, and Akiva likened it to a list a 12 year old would come up with. Jerry suggests George try going back in like nothing ever happened. In the real story, Larry was told to do this by his neighbor, Kenny Kramer. George is back at the meeting Monday morning, and is immediately called out by a loud woman in his office. When the boss comes in and notices George, he asks him why he’s there since he quit. George tries to pawn it off as a joke, but the boss doesn’t buy it. He tells George to get out, calling him a loser in the process. Jerry is picking up his clothing at the Laundromat when George randomly walks in. He recaps the story for Jerry, and tells him that it’s not over yet. He plans on slipping the boss “a mickey” at a company party in order to get revenge. Jerry thinks he has lost his mind, but George is excited, saying that it’s like something out of a movie. George is going to enlist Elaine’s help in getting this done, getting her to agree to do this by telling her that this guy doesn’t recycle. Back at Jerry’s apartment, Kramer informs Jerry that Newman went through with jumping out the window, but it was from the second story, and was done just to get Kramer’s attention. Rob said that this was another real life story from Larry David’s life, since he had a neighbor who did the same thing. Akiva and Rob mentioned that they can really tell this episode was written solely by Larry. Out of left field, Jerry realizes that he left $1500 in the laundry bag and forgot it before bringing it to the laundry mat. Rob found this to be one area in the episode that was underdeveloped. When Jerry asks the Laundromat owner about the money, the guy acts shady about it. Akiva said he knew the guy was innocent because he was wearing a Mets hat, and that he’d be wearing a Yankees hat if guilty. The next scene has Elaine and George preparing to slip his boss the mickey, both excited for their movie-like caper. The scene switches over to Jerry and Kramer at the Laundromat, where Kramer has brought a bag of cement to dump in a washing machine to exact revenge. Back to Elaine, she starts to get the boss’s attention, failing at first. Once she mentions that she is going to a nudist colony and enjoys being naked in the office, his attention is peaked. Back to Kramer, we get the first of many iconic physical comedy moments as he attempts to pour the heavy bag of cement. Rob pointed out that Michael Richards requested an actual 60 pound bag to make the scene more authentic. The scene cuts back to George, where he gets the loud woman from his office to move from the seat next to his boss so he can pull off dosing his drink by threatening to pull off her wig. Elaine keep’s the boss from looking George’s way and he is able to spike the drink. When the boss sees George sitting next to him, he offers him his job back. George then tries to keep him from drinking the spiked drink at first, but after many jabs from the boss in his speech, he has him drink up. Without explanation as to what happened to the boss, George is back at Jerry’s apartment going over more job options with Jerry and Elaine. Rob and Akiva pondered several options of what may have happened, finding it strange that there was no explanation of why George didn’t ultimately keep the job. Kramer then walks in with the envelope of Jerry’s money, which was in the bag of Kramer’s clothes. Since they did $1200 damage to the washing machine, Jerry has to take the money down to pay the Laundromat off. Rob and Akiva estimated that the tally of Jerry’s lost money has now gone up to around $5000. The episode ends with Newman yelling from the roof of the building that he’s going to jump, though since he tells Kramer he’s seeing a movie later that night, he’s obviously not. They both rank this episode pretty highly. Rob ranks it number three, behind “The Pony Remark” and “The Jacket”. Akiva has it number two, with “The Jacket” third out of the episodes discussed so far. Next they answer some emails. Emailer Hunter pointed out that the laundry shop owner looks like a character from the cartoon Futurama, but the guys thought it to be too obscure a correlation. Hunter also noticed how the characters on the show are often committing crimes. Rob and Akiva both agreed that it seems to happen quite frequently, with this episode having Kramer committing vandalism and George attempted murder. Emailer Ariel thought it too bad that George wasn’t around in 2014, since his job interests would lead him perfectly into podcasting. She also mentioned how Elaine saying she doesn’t even have a phone would not be the case on 2014. This prompted Akiva and Rob to talk about the other things that wouldn’t relate today. They thought Jerry could write a scathing Yelp review of the laundry mat for stealing his money to exact revenge, and George would have a keycard for his building that would have been deactivated when he quit. Please let us know what you thought about the episode in the comments and what Seinfeld related podcast ideas you’d like to hear about before we attempt our top 25 episode countdown. Next episode to recap for the guys will be “The Heart Attack”. 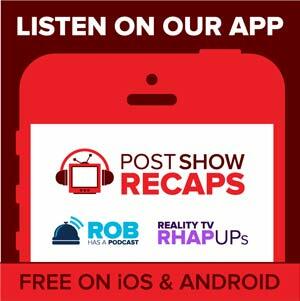 Send your emails to [email protected], and leave your comments on the website at postshowrecaps.com/seinfeld. You can follow them on twitter @robcesternino and @keev26.